We live in Iowa. This winter has been a long one and, for the past week or two, incredibly cold. Of course, that means we’ve been cooking a lot of warm, hearty winter meals recently. One of my favorites among these is what we call “anything” soup. Simply put, it’s a simple soup where we add “anything” we have on hand to make it more delicious. We have, on occasion, made it with a stone in the pot, which is a very fun thing to do with children in the tradition of the classic children’s book Stone Soup. This recipe is stunningly easy. You don’t really need anything other than what you find in your cupboard. If you have an extra tomato left over, perfect. Extra potatoes? Perfect! Spices in the cupboard? Perfect? An extra carrot or stalk of celery? Perfect! Onions? Perfect! Spinach? Perfect! Beans? Perfect! Here’s some of the stuff we had on hand. 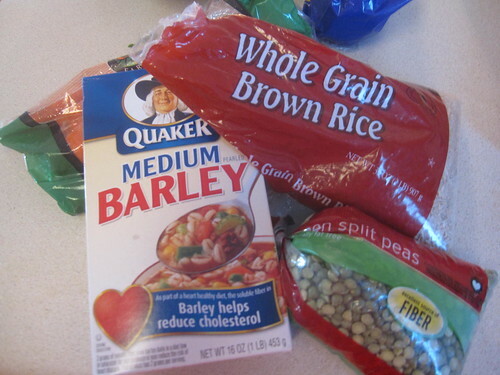 We had barley, rice, and some dried split peas in the cupboard. 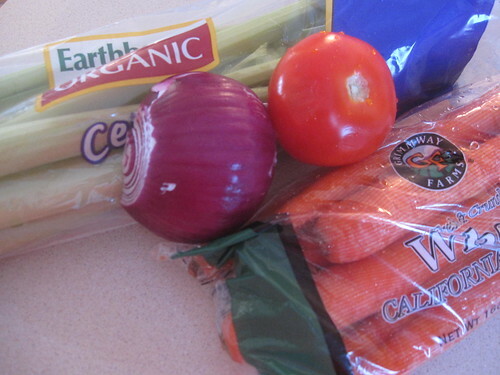 We have a leftover onion, a leftover tomato, and some carrots and celery for other recipes that won’t require all of those vegetables. 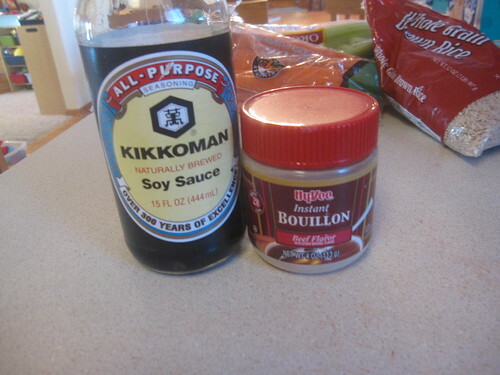 We also had some soy sauce in the fridge. Interestingly, we’ve discovered that many kinds of beef bullion are just spice mixes, containing no meat at all, so we’re using a bit of that, too. The only thing you might need to do is that if you’re using dry beans, you could put them in water and allow them to soak overnight and throughout the next day. We started off by getting the liquid hot. 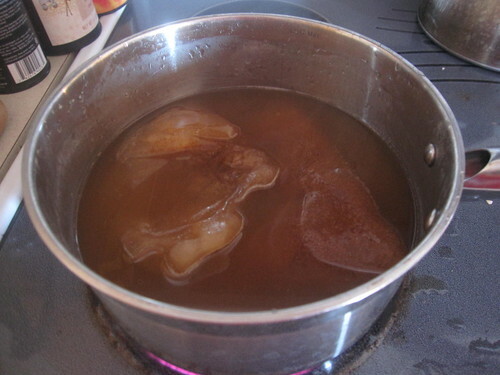 In our case, the base of the soup is our homemade vegetable stock, which we’ve frozen and are now quickly thawing (hence the large stock “ice cubes” floating in this picture). 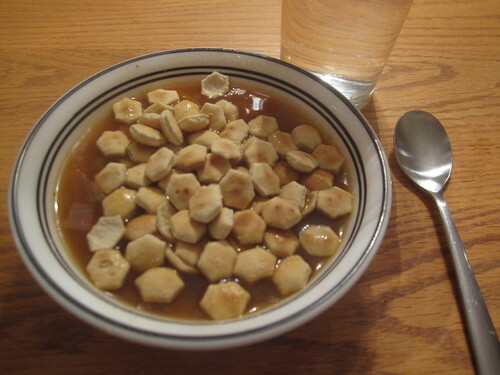 For your liquid, you can use pretty much anything – beef broth, water with some bullion in it, chicken broth, whatever you’ve got on hand or can find for cheap. Next, once the soup is up to a boil, we just add ingredients according to their cooking times. Usually, this means starting with beans, adding barley and such a bit later, and eventually putting in vegetables. Check the boiling time for vegetables online using Google if you’re unsure – follow the directions on the package for beans, barley, macaroni, and the like. Once it’s done, toss some crackers in it and enjoy! What I’ve found is that as long as you stick to vegetables you like, you can almost never go wrong with this soup. It’s pretty much impossible to really mess this up. Whatever you come up with will be good – sometimes it will be great, and other times sublime. It’s “anything” soup, so you can put anything in it. Chicken, ground beef, leftover steak pieces, sausage – all of it is just fine for “anything” soup. This is a spectacular way to use “miscellaneous” leftovers on a cold winter day.